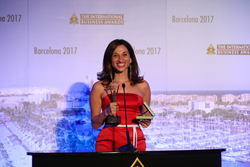 The extended final entry deadline for The 2018 International Business Awards in July 11. The International Business Awards recognize achievement in every facet of the workplace. Categories including, Management Awards, Company of the Year Awards, Customer Service Awards, Entrepreneur Awards, PR Awards, Web Awards, and much more. Stevie Awards are conferred in seven programs: the Asia-Pacific Stevie Awards, the German Stevie Awards, The American Business Awards, The International Business Awards®, the Stevie Awards for Women in Business, the Stevie Awards for Sales & Customer Service and the new Stevie Awards for Great Employers. Stevie Awards competitions receive more than 10,000 entries each year from organizations in more than 60 nations. Honoring organizations of all types and sizes and the people behind them, the Stevies recognize outstanding performances in the workplace worldwide. Learn more about the Stevie Awards at http://www.StevieAwards.com.